As the weeks go on and the weather gets warmer, we continue to peel the onion that is the Pentagon’s budget request. This week, we’re focusing on bombs and missiles. Over the past five years, the U.S. military has expended a lot of expensive munitions, mostly in the air campaign against Islamic State militants in Iraq and Syria. The race to rebuild its global stockpiles, notably in the Pacific, has led the munitions’ makers to increase production and invest in the factories and next-gen technologies needed to make even more. The 2020 budget request shows that the rebuilding effort is gaining speed. The Army, Navy and Air Force all plan increases in overall munition spending — and increases in funding to develop new munitions. That’s particularly true of the Army, Mitre said. “It’s a good news story for the Army trying to creatively apply the National Defense Strategy logic to their work because what they’re doing is not just trying to recreate legacy systems, they’re investing in [research and development], and particularly [science and technology], to try to come up with the next wave of munitions that are going to be relevant for a high-end fight against the Russians,” he said. A Future Interceptor, the Precision Strike Missile, Long-Range Precision Fires and Mobile Medium Range Missile, are among the Army R&D projects listed by Byron Callan, an analyst at Capital Alpha Partners, in an April 1 note to investors. The Navy, by contrast, appears to be prioritizing stocks of existing weapons, Mitre said. Then there’s hypersonic weapons, which are of intense focus at the Pentagon these days. The 2020 request includes about $1.7 billion for hypersonic efforts, according to data compiled by Callan. So what other types of advanced development is being funded? 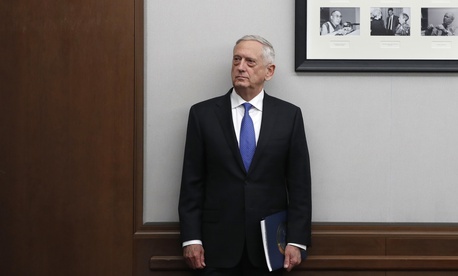 Callan deduces that there may be a classified medium- to long-range air-to-air missile program. How did he come to this conclusion? Well, for one, the Navy plans to stop buying a staple of air-to-air combat: Raytheon-made AMRAAM air-to-air missiles, in 2024. Air Force purchases of the missile appear to dry up around 2026, Callan writes. “We don’t know if Raytheon keeps this particular franchise or if it’s won by another contractor,” he writes. Money for bombs and missiles are spread across the Pentagon’s base budget request and the Overseas Contingency Operations account. Tomahawk missiles, JDAM guidance kits, SM-2, and SM-6 are 100-percent funded through the OCO budget. 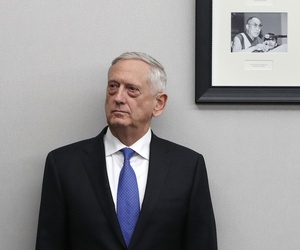 One Big Missile Defense Deal: Lockheed Martin received a $2.5 billion deal on April 1 for THAAD missile interceptors for the U.S. and Saudi Arabia. You’ve reached the Defense One Global Business Brief by Marcus Weisgerber. I’ll be at the National Space Symposium in Colorado Springs next week, so give a shout if you want to link up at The Broadmoor. Send along your tips and feedback to mweisgerber@defenseone.com or @MarcusReports. Check out the Global Business Brief archive here, and tell your friends to subscribe! Alliance members should look to mimic Britain, which created an entire government office to scrutinize Huawei’s products for security problems. Much criticism of military AI projects is rooted in “grave misperceptions,” say current and former defense officials. Mark your calendar for April 11 at 9:30 a.m. EST when four top Pentagon leads will testify before the Senate Armed Services Committee. 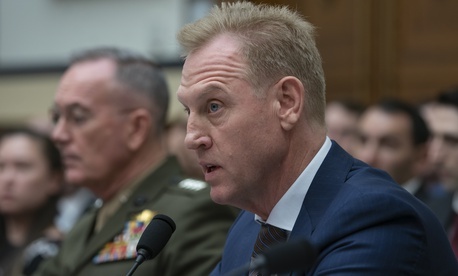 The witnesses: Acting SecDef Patrick Shanahan, Air Force Secretary Heather Wilson, Joint Chiefs Chairman Gen. Joseph Dunford, and Gen. John Hyten, head of U.S. Strategic Command. For those of you (like myself) who plan to be at the National Space Symposium in Colorado Springs next week, looks like we’ll have to arrange a breakfast watch party. The U.S. Air Force has once again suspended deliveries of new KC-46 tankers after more debris has been found within aircraft. It’s the latest setback for the project that is years late and billions of dollars over budget. To recap, with help from my colleague Brad Peniston: The Air Force received its first tanker in January, but has withheld from Boeing a percentage of the payment each plane because of problems. Just weeks after deliveries began, they were halted because tools and other debris were found inside some of the aircraft. The Air Force started receiving tankers again, but now Air Force Secretary Heather Wilson told Congress this week that deliveries have stopped again (they were formally stopped on March 23). Here’s where things stand now: The Air Force has received seven KC-46 tankers. Boeing and Air Force officials have been meeting to determine a path ahead. “Resolving this issue is a company and program priority,” Boeing spokesman Charles Ramey, said in an emailed statement. Mind you this all comes amid a federal investigation into Boeing’s 737 Max following two deadly crashes of the company’s newest passenger jetliner. 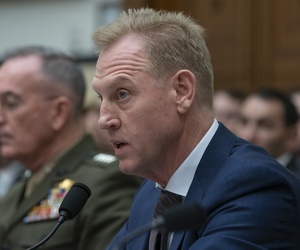 Will Roper, the head of Air Force acquisition, recently said Boeing has a “severe situation” in its assembly line culture. With billions of dollars up for grabs, Lockheed and Raytheon are teaming up to compete for a deal to build hundreds of new air traffic control radars and sensors. In addition to monitoring planes, the new cyber-hardened radars — officially called the Spectrum Efficient National Surveillance Radar — could be used for tracking weather and “emerging airspace threats” like drones in urban areas, according to Brian Roselli, vice president of Raytheon’s mission systems and sensors business. Aside from getting more advanced radars, the new system will free up spectrum that will eventually be used in 5G communications. “It’s … the largest radar production and deployment program in U.S. history,” Rob Smith, vice president and general manager of radars and sensors at Lockheed Martin, said on an April 1 conferene call. The Federal Aviation Administration, Defense Department and the Department of Homeland Security are jointly overseeing the project. The Air Force is supposed to receive its first EC-37B, a new Gulfstream version of the Compass Call electronic attack plane, in 2021. Remember, a 2017 decision to move Compass Call from a C-130 to the Gulfstream was controversial at the time. That 747-8 flown to Boeing’s San Antonio plant is supposed to start getting converted into the next Air Force One about a year from now. Air Force officials are expected to approve the plane’s design in this fall. The Air Force is converting 19 Army Back Hawks into search-and-rescue configuration to make up for battle losses. “During fiscal year 2018, the [HH-60G Operational Loss Replacement] team resolved two major developmental testing deficiencies delaying entry into operational testing, and delivered the second developmental testing aircraft, clearing the path for full quantity delivery in fiscal year 2019/2020,” the report states. Years ago, the Air Force planned to replace its lost Pave Hawks with new Black Hawks. However, it only bought a few, which are used for security missions stateside. Eventually, the Air Force decided to buy and convert brand new Black Hawks, work that will take years to complete. The Army aircraft being modified now will provide immediate relief to the Air Force’s taxed rescue units. The Italian aerospace and defense company wants the Navy to buy its AW119 — a helicopter built in Philadelphia and flown by militaries and government agencies around the world. Leonardo is hoping the Navy follows the Air Force (in September they chose its AW139 to replace UH-1 Hueys that guard ICBMs) in choosing one of its helicopters. The Navy plans to replace its TH-57 training helicopters. Airbus is pitching its H135 and Bell, who made the TH-57 in the 1970s, is pitching a version of its 407 helicopter. Leonardo is pitching its AW119 solo, as opposed to the Air Force Huey replacement where Boeing is the prime contractor. Speaking of Leonardo, its American arm, Leonardo DRS, turned 50 on April 1.